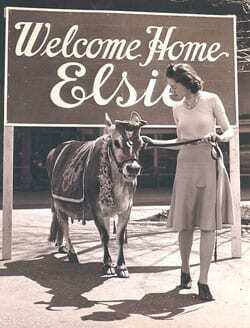 When you enter the Hamlet of Wallkill, you are greeted by the happy face of the Borden Company’s mascot, Elsie the Cow. The company’s website states that this mascot dates to the 1930s. Underneath Elsie is a sign stating that the Hamlet of Wallkill was the location the “Home Farm” of John G. Borden. 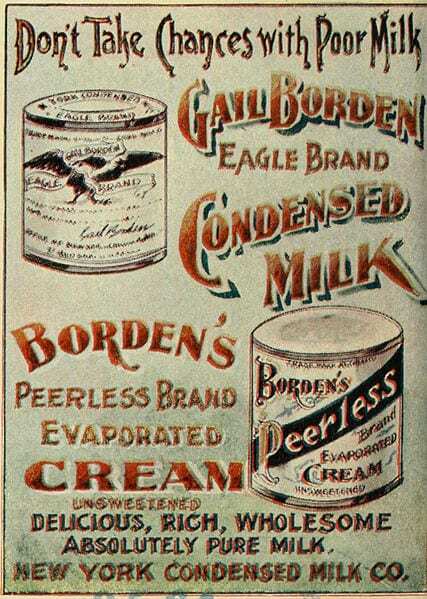 Thus, many commonly believe that Borden Condensed Milk was in fact invented in the Hamlet of Wallkill; however, its origins can be traced to Burrville, Connecticut and Gail Borden, Jr. Actually, the business was not originally called Borden at all – that title would come later. Gail was born in Norwich, Connecticut on November 9, 1801. He spent his entire life hoping to better the lives of Americans at a time when their diets were greatly limited due to a lack of refrigeration. When he moved to Texas in 1829, his primary goal was to find a way to improve people’s livelihoods by keeping food, especially milk, from spoiling. The company’s website relates that the impetus behind Borden, Jr.’s ideas involved a trip overseas. During the 1850s, Borden, Jr. was in Europe where he demonstrated that the meat pies he invented did not spoil. The meat pies, according to his patent, were dehydrated in a way to prevent them from going bad. In 1852, Scientific American reported that the meat pies were successful in Europe, as the Royal Navy periodically had problems with meat turning sour. During his return from Europe, Borden, Jr. encountered something which changed his life…and would eventually affect the world. While on a boat crossing the Atlantic Ocean, he had the misfortune of witnessing several children perish. The cause of their deaths was all too common – they drank milk which had become contaminated over time. He became determined to find a way to keep milk fresh in order to prevent anyone, let alone children, from dying. For domestic use it will be the means of saving much in families, especially in warm weather, and at no time need there be any necessity for a person taking a cup of milkless coffee, even after a thunder storm, or a week of hot weather, with the thermometer daily at 97º in the shade, as it has been in this city [New York City] during the past week. After receiving a patent, Borden, Jr. decided to open a small plant in Wolcottville, Connecticut. Unfortunately, his innovation was anything but successful – it seemed that it would not catch on with the public. Although Borden, Jr. appeared to be a genius at inventing, he was not adept at marketing. Borden, Jr. again relocated, this time to Burrville, Connecticut. According to the company’s history, he named the new location of his business: “Gail Borden, Jr., and Company.” This business venture was also a failure and Borden, Jr. was running out of money fast. The Texas Historical Society biography of Borden, Jr. relates that the reason for his mounting debt was also due to the unpopularity of his meat pie (outside of Europe). His fortune would change, however, after meeting with his future partner, Jeremiah Milbank. Milbank had the capital required, as well as experience in the food industry, to market condensed milk properly. According to Gail Borden: Dairyman to a Nation, Borden met Milbank, who was a wholesale grocer, banker, and railroad financier, in 1858. During that same year, the two men formed a partnership and ultimately opened up a factory that proved successful. 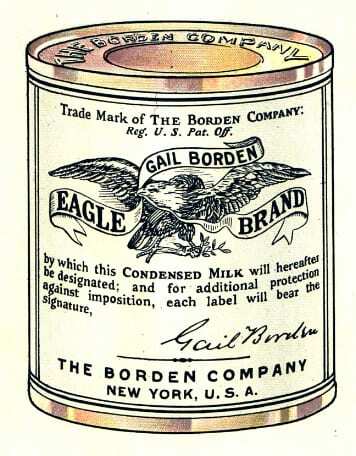 They decided to change the name of the business from “Gail Borden, Jr., and Company” to “The New York Condensed Milk Company.” By this time, Borden, Jr. was living in New York City. The collaboration between the two men could not have been better timed, as needs which arose from the Civil War greatly benefited The New York Condensed Milk Company. While working on marketing his inventions, Gail Borden, Jr., also started a family. Borden, Jr. was married three times and with these wives produced seven children, one of which was John Gail Borden born in 1844. This son would follow his father’s path in the condensed milk business. In an effort to enhance the business, Borden enrolled in Eastman College in Poughkeepsie. He wanted to obtain a business degree in order to manage his family’s company. However, these plans were interrupted by the Civil War. When the war began, Borden was almost 18 years old. He enlisted in the 150th New York Volunteers in Poughkeepsie, where he was attending college. His father’s condensed milk business caught the eye of the U.S. Army; as a result, they contracted-out his family’s milk to be provisioned to the Union Army. One local story circulating in Wallkill, which cannot be substantiated, involved Borden being wounded on the battlefield. An African-American soldier came to his rescue and saved his life. The same anonymous source, which is closely linked to the Borden’s mansion and its history, related that Borden never forgot this kindness. He spent part of his life looking for this individual. Once Borden located the man, he took care of him and his family for the remainder of their years. After the war, Borden returned to Brewster, New York in Putnam County where Borden, Jr. had built a condensery in 1864. According to information from The Southeastern Museum in Brewster, it “stood by the East Branch of the Croton River where Route 6 and Route 22 meet today.” This factory met its demise, according to the museum’s records, when New York City flooded prime dairy farm lands for the Croton Reservoir System at the turn of the century. Borden, Jr. died in 1874 and left his business to his John G., who would become its second president. As early as 1866, Borden wanted to “establish a farm, and a model community near a large city.” It made sense to him, then, that the location of the family business needed to remain close to New York City. 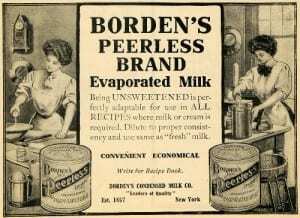 After all, a large part of the Borden’s eventual fortune originated there due to a great demand for fresh food and milk. After searching for some time for an ideal location for these products to be produced, Borden finally settled on an area known as “the Basin” in the Town of Shawangunk in 1881. The Basin occupied the region where the present-day Hamlet of Wallkill is located. He purchased what was then known as “the Andrews farm and about 200 acres of prime farmland.” Borden and his family, which by this time, included his wife Ellen and three children Marion, Lewis, Gail, and Penelope (known as Nellie), chose this location partly because it was near railroad, water routes, but its beauty. In fact, Mentz attributed the hamlet’s entire evolution to the Borden Family. They quite literally created a town parcel by parcel. Mentz remembered that they “had the entire land east of the railroad laid out in building lots with wide streets, such as Lavoletta Street, which is a double street.” Borden also hoped to create “a cemetery on Bona Ventura and First Street,” but it never seemed to have materialized. This would have been near the present-day police station. Additionally, Borden gave the building where the firehouse currently stands to Wallkill, which he envisioned being a bank, and also donated a town square. Borden also foresaw a part of Wallkill to be commercial in nature. In his recollections, Mentz believed this area to be where Fair Rite Corporation is today. Even on Home Farm, writes Alfred Smiley, Borden built “houses for farm labor, many barns and silos, and two water-powered grist mills…Orchards and vineyards, rolling grain fields and pastures.” Borden also extended his vision of park-like surroundings to the people who worked and lived around Home Farm. He included two parks there that still exist in Wallkill today. When John G. Borden died in October of 1891, he was vacationing in Florida. It was where he retreated in the cold months because of his poor health. His body was returned to his beloved Home Farm where he was buried, according to tradition, in a spot that he chose. Borden did not see his ultimate dream realized, for when he died he was still far from the completion of his paradise. His work would be continued by his daughter, Marion, and his widow. His daughter became the president of the company and continued her father’s legacy until her own death. It was under her direction that the company changed its name in 1899 to the Borden Dairy. When traveling the streets of the Hamlet of Wallkill, you are reminded of the legacy of the Borden Family. Their hand in shaping the hamlet is still seen and felt. In fact, Borden’s “grid” for the growth of the Hamlet of Wallkill is still followed, for the most part, today. Only recently, according to local newspapers, has the hamlet started to outgrow the original town square devised by Borden. In an effort to recognize the impact of the Borden Family on the town, Borden Day has recently been celebrated every year. I enjoyed your article, one note it is the Southeast Museum in Brewster, not Southeastern. With all the history about Elsie not one of the articles mention how Elsie got her name. I had a client who was a model in the 1930’s and one of her friends told me they named the cow after her. I just googled her obit and found this is true. Now I’m wondering if that’s her in the welcome home Elsie picture. Would anyone know who the model is? Donna – When you say, “I just googled her obit and found this is true”, it might be helpful if we had a link to your friend’s obituary (or her name). It might help others who are trying to verify if the relation between the model’s name and Elsie are true. As with all web searches, information found has to be verified with reputable web sites and companies. I was seconded to Price Waterhouse in Columbus, Ohio in 1989 to work on the Borden Inc audit. I worked on the Borden account in Southampton , UK. When i left Columbus Borden and Price Waterhouse gave me a leaving party and Elsie, the Borden cow, attended my party as guest of honour. I was surprised when KKR bought Borden and then asset stripped it. I started some research tonight on Borden having just bought some Cocio chocolate milk and started to remember that I visited the Cocio plant in Denmark in 1990. I worked at Borden’s Milk Co. in California my Junior and senior years of high school in “55” and “56” during the summer. I worked the switch board by hand, accepting calls requesting holds on home delivery and orders throughout California and walk in’s at the counter. Had embarrassing moments when I accidentally disconnected the head of the company. It was a memorable time in my life since Borden’s was a popular Co, and the first time I had money of my own to spend along with baby sitting. I inherited Elsie and Elmer salt and pepper shakers from my family and was given a stuffed animal of Elmer and Elsie’s named Bullregard, It warms my heart to recall those times. I enjoyed reading the heart warming comments. During the first half of the 20th century my mother’s aunt lived in an apartment at 123 Rivington St. on New York City’s lower east side. The street level retail store was a business called Borden’s Dairy Restaurant and her aunt worked there as a cook . The restaurant is long gone but I am wondering if there might have been a connection to the original family business. Why is Borden’s not in Mich anymore? I’m 79 now and when I was a young boy in Easley South Carolina, Borden’s made a frozen strawberry pie. It was in an earthenware pie plate( which was kept and use as bowls for the table) with Borden printed on the inside bottom of the plate. They put in strawberries and covered them with Borden’s vanilla ice cream. You have never tasted anything so good. Does anyone remember these?? Sure wish they were still made. I have an original clear glass condensed milk container. It measures 3″ across the top and 3-1/2″ high. Across the top is written “This glass to be filled even full” 1858 . 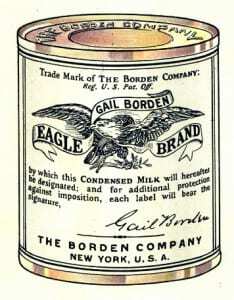 On the front is an eagle with Gail Borden written above the eagle and Eagle written on bottom left , Brand on bottom right of eagle. On the bottom of glass is New York Condensed Milk Co. Since it became New York Condensed Milk Co. in 1858. In 1899 it became Borden Condensed Milk Co. In 1919 it became Borden Co. telling me this glass was made between 1858 and 1899. Can you tell me the value of this glass? I remember going to the Borden dairy on a field trip as a child and getting an ice cream bar at the end of the tour in Elgin, Illinois . I throughly enjoyed this article, I was born and raised in Walden New York(lived there for 24 years) and my sister and her family still live in Wallkill New York. I’ve ridden past the Bordens farm hundreds of times and now smile as I now know the history of this company. I’ve been in retail for 40 years and work in a supermarket(here in Florida) in the cheese dept.This week Bordens cheese is on sale,and I’m certain I’ll be sharing this story with a few of my customers 😀 thanks again for all this history behind this company , although the name Elise never was mentioned I would love to know about her as my Grandmother’s name was Elise and can remember her saying ” Why did they have to name a cow after me” She was born in 1905,do you know when Elise the cow received her name? I have gone to the State Fair of Texas every year since I was in my 30’s and one of the highlights was seeing and getting to pet Elsie and her calf Beauregard in the Food & Fiber building and getting a pint of milk from the Borden store. It’s sad to go there now since Borden was bought out by Smuckers and they have not continued that memorable tradition. Born in Norwich, CT? Wasn’t he born in Norwich, NY? I have acquired a hard-backed recipe book called “Borden’s’ Prize Recipe Album” (Borden’s Cooperative Housewives Recipes). It’s very old. Does anyone know about when this was published? It says it is made up of prize-winning recipes from the contests conducted by the Borden Company. 36 pages. I am glad you enjoyed the article. I believe it is ca.1925? How cool is this! I’m working on the Burdine (Borden/Burden) genealogy side of my family and just discovered that Gail Borden is my cousin! Thanks for the great article and pictures! Search for Borden’s milk and you will find a number of regional receipts for milk, a film clip of the former Borden’s Milk factory fire, post cards with various views of the factory. 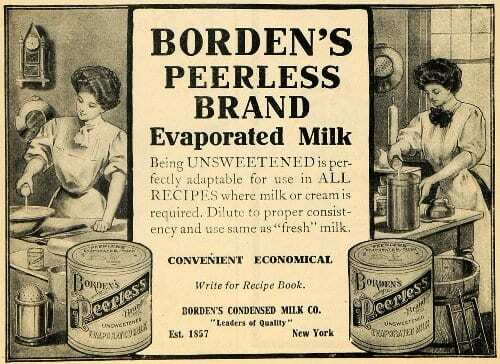 The Southeast Museum in Brewster, NY also has exhibit material about Borden’s Milk that Executive Director Amy Campanaro was too modest to mention in her earlier post! Bordens would later purchase the Arkwright cotton mill just east of New Berlin in Pittsfield, NY, which due to the influx of workers from Hoboken, NJ took on that name, and a farm further north on Rt 80, both on the Edmeston branch of the O&WRR. Two natives of Morris, NY would also have a small role in the dairy industry, advertising legend Draper Daniels who along with the “Marlboro Man” and “Jolly green Giant” is credited with creating “Elsie’s Twins” for some campaign. The other being Henry S. Matteson, whose early essays on butter, cheese and milk ended up in a appointment to run the NY state dairy department. But when Bordens began buying out small creameries and cheese factories around WW1 and reducing milk prices, farmers were able to reopen or establish new cooperative cheese factories as an alternative, the Morris cheese factory closing by 1919, and the building used for cold storage by the Linn Tractor Co. and later torn down c. 1977. I grew up in Wallkill lived next to Fairite. Didnt the Bordens fund the school there too? Attended that school til my senior year in 69/70. Great little town to grow up in. Thanks JB! My father worked for Borden’s in Evans Mills New York for 25 years until they closed the plant in 1957. We lived in a Borden owned house next to the plant. My grandparents lived in the other Borden owned house across the road from ours. The former owner of that manufacturing site was Beaumert. My grandfather, Robert Colvin, was the superintendent of Bordens Creamery in Washingtonville NY for many years (ending in the 1940s). A few years ago, I donated many professional photos of the creamery (including interior photos of workers and the equipment they used) to the Moffat Library in Washingtonville. Bordens in Sacramento, California sold the best lemon custard ice cream I have ever eaten in my 80 years. Bordens left Sacramento decades ago. Sad. I’m surprised no one asked why they ruined Borden’s chocolate milk, which, to me was the most perfect drink, ever? They took out malt and made it too “kiddish”. My Grandfather or Opa, Julius Schroer worked at Borden for probably 40 years as a foreman until he retired and lived in Ridgewood Queens with my grandma Oma Martha Schroer probably anywhere from the 1920’s or 30’s until the 1960’s or 70’s. 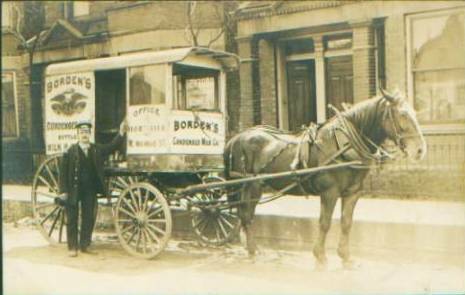 Would anybody have an idea where exactly Borden was located in Queens or NYC at the time and would anybody have some collections of historical photos from that time of the workers? Maybe of Julius Schroer my grandfather who worked for Borden 40 years??? I would LOVE to see Any!!! !